I realize that asking a question and trying to get or even FIND the answer is getting a bit ridiculous on the Crusty Bread page. This is by far the most popular post I have with over 1.2 MILLION page views. Who knew???? Oh my gosh. I knew the first time that I made this bread that I had to share it with the world. It’s so easy, yet so delicious and has SO many possibilities. Here is your turn to share, ask, comment, complain, or rave about your bread success. I will first begin with the most frequently asked questions. After that I would love for you to share your amazing bread creations. I just can’t believe some of the combinations that have been shared so far. What fabulous cooks you are. I hope this works and makes it easier for you to view comments and ask questions and get responses. I must begin by saying where the recipe originated if in fact, it originated anywhere…really. I think bread has been baked for centuries using flour, salt, water, and yeast or another form of leavening. As far as I know, the recipe for “No-Knead” bread dough was printed in the New York Times. I don’t know what month, day, or year. The originator is Jim Lahey of Sullivan Street Bakery. That’s all I know. I found the recipe in a booklet using enamel cast iron pots. At the time I posted the recipe I had no Jim Lahey even existed or I would have definitely given the man full credit for this wonderful bread and idea. That said…. Remember before beginning to create that this bread is highly forgiving. Don’t stress over the fact that you haven’t proofed the yeast or that you’re not giving the dough a second rising time. It’s super duper sticky and will stick to your hands, feet, and hair or anything else it comes in contact with. Play with the recipe for your location. Altitudes differ and that can affect the bread. This recipe is not your ordinary bread recipe. Just chill and follow the instructions. There are some fabulous comments and suggestions. Hopefully, you can find answers to questions a bit easier now. Q: Can I use self rising flour? A: My smallest pan is 5.5 quart and the loaf barely fits. A: I don’t know. You could try using less 1/4 cup less liquid. Or add a bit more flour. Make sure your dough appears to be dry when you first mix it. It will have more moisture during the rising time. There are many determining factors when bread making. Is your flour old? It does make a difference. Sometimes store brand, sale flour isn’t so great and should probably be left on the store shelf. Make sure your flour is fresh and a good quality brand and make sure your yeast is fresh and active. A: No. I have let some dough sit as long as 24 hours and the bread was beautiful. Q: Do I have to grease or oil the pan? Will my bread stick? A: No you don’t need to grease the pan. I have never had the bread stick when using a cast iron pot. I haven’t tried anything else. The best way to be certain that the bread won’t stick is to form the loaf on a sheet of parchment paper and lift the bread into the pan using the sides of the parchment. Leave the paper in the pan. It’s won’t burn. When the bread has baked, just lift the sides of the parchment out of the pan. Voila! Q: What temperature should my water be? A: I just use cool water straight from the tap. Q: Can I add sugar? What is the difference between active dry yeast and instant yeast (also known as bread machine yeast)? Hi! Me again! I have some input – mostly add in ideas that have been huge hits! I found that using the parchment makes all the difference – to any loaf, it makes it easy to put in and take out and never burns. Also, I reduced the baking time by 5 minutes for each step – more tender bred, and just as crispy crust. I also add 1 T of raw sugar to each loaf – they rise higher for me. 7. Apricot, cranberry, and chocolate – I put too much in – so i had very dense bread – but it got eaten!! 9. Marinated artichokes and raw garlic – sliced 6 cloves very thinly – oh boy! I hope listing these is ok – i spent soooo long scrolling thru to see other peoples ideas, it seemed like this would be a good thing – found a few to try, and in fact making a pistachio and cranberry tonite, and an olive mozerella – new is good – but i get asked for the Jalapeno one most often!! Thanks again for this blog post! Most of the comments I receive are pretty fabulous like this comment. Keep them coming. 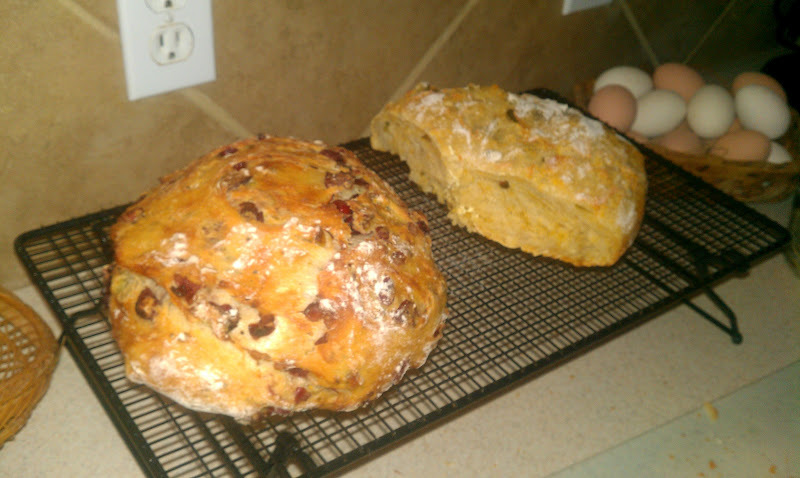 Thanks, to Sarah for submitting photo’s of her cranberry/pistachio and jalapeno /cheddar loaves. Don’t they look amazing? I started out baking this bread not using parchment paper. Just drop the dough into the hot pot. I have never had the bread stick to a cast iron or enamel cast iron pot. Just carefully lift the hot bread out of the pot with hot pads. The use of parchment paper makes it easier to drop the dough into the hot pot and lift it out. No worries if you don’t have parchment paper. Wanted to try something different for Christmas, so using basic recipe quartered I made this using mincemeat (as in mince pies) with chopped basil. Fourth trial, 1/4 basic recipe smoked salmon trimmings, lemon zest, finely chopped fennel. Egg wash and salt/pepper as previously. Wow Lucy! You are brilliant! Amazing breads are coming out of your kitchen. I love your creations. thanks for this recipe of the best bread ever! I will cook it and shre my results! I had made this recipe hundred of times in Canada and never had any problem. However, recently I have moved to New Zealand but have problems with the yeast and/or flour, the dough just won't rise properly. Has anyone from New Zealand tried this recipe? Is yeast or flour in New Zealand much different from Canada/US? I even tried both instant yeast and active dried yeast, double the amount of yeast, the dough is still half the height it normally is. The bread ends up looking like focaccia! This was so easy and so delicious! Thank you for sharing! I added Parmesan, fresh basil and minced garlic that came packed in oil. AMAZING! Use sourdough start every time with perfect results. Substitute 1/2 cup of start for the yeast, and reduce the water by 1/4 cup. Here it is January 25, 2017 and this bread is still being baked, and this wonderful site is still popular. Thanks for the video, it is extremely helpful. I started the rise in the kitchen but was afraid it was going too fast so transferred to the fridge after a few hours – total time in fridge is 18 hours. I'm happy to say things look just like the vid! Just going into the oven now and I know it will be great. Thanks again. I have tried this recipe, and variations of it. But, my crust comes out like a stale potato chip. Not really crispy, not really soft. Quite chewy with some crunch. Rubbery would by the word. The crumb is actually wet-ish with an odd texture that, like the crust, tends to stick to my teeth. The flavor of the bread and crust is just awesome! But, the texture is a put-off. Any hints? I made one with olive oil and a bunch of italian seasoning – came out great and smelled awesome. Followed your recipe except that I added 1 Tablespoon sugar. I let it sit for 11 hours. It looked exactly like your pictures both before baking and also while cooling on the counter. But I knew something was wrong because the smell while baking felt a bit off. When I tasted the bread it was slightly chewy and sour as well. Looked like it was over yeasted – could that be the case? Any advice would be appreciated because so many users have had so much praise and success – I want to be part of it! We like a little sweeter bread. Is it ok to add sugar or honey to the basic recipe? Have you ever tried making it in small loafs for soup bowls? Has anyone tried a rye flour recipe? I had seen one for whole wheat where you use 2 3/4 cup of whole wheat flour and 2 cups of water. The bread turned out wonderful. Wondering if this ratio would work for rye bread as well? You should definitely check out Jim Lahey's cook book. I got it about 6 years ago and LOVE it. I first found this recipe in Mark Bittman's How to Cook Everything Book and that's where I learned about the magic of Jim Laheys methods. This bread is absolutely scrumptious. Hi Karin, I have never tried kneading in honey, but I'm sure it's delicious. This is a pretty forgiving recipe, so the addition of honey would be great. Difficult to knead in after the rise, however. Hi there, I have a quick question. I am trying this bread today for the first time. Mine is currently covered and sitting for the next many hours! 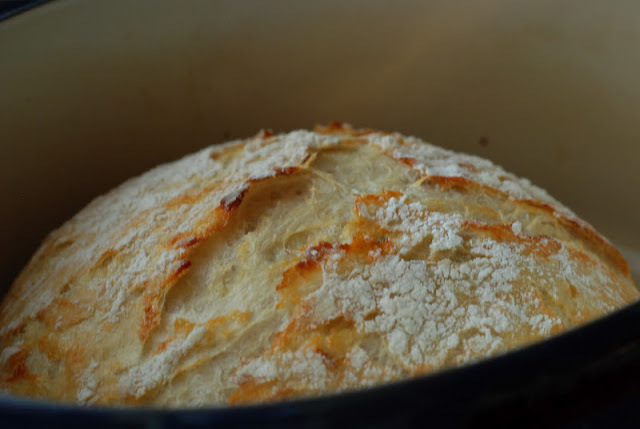 I read another bread recipe this morning where someone kneaded in honey, then baked the bread. Have you ever tried this, or have any suggestions as to whether this would even be a good idea? Just wondering. Thank you! Can you use muffin tins for this bread or does it always need to be covered? I don't pack in the flour. I stir and scoop the flour before I measure. It really doesn't matter what you use to cover the dough. Just as long as the dough doesn't dry out on top. I've just made my first bread EVER and this makes me SO HAPPY cos i just love bread so much. It turned out a bit more dense than I had hoped for and I know it's cos I added a bit of extra water when I was mixing it with the flour cos I thought I had to really coat all the flour. I read a comment that actually when I leave the dough to raise, the dry bits of flour will just work its way in by itself so that's noted for next time! I do have a question about how long I can keep the bread after it's been made? I read that a lot of breads from bakeries have preservatives in them to extend the shelf life so I wanted to know how long this "all natural" bread can keep? Thanks Janet! Does the flour have to be packed when measuring? Also, I have a mixing bowl with an air-tight lid. Is this fine to use or should I still cover the bowl with plastic wrap overnight? Yes, you can let the dough rise longer than 24 hours. I generally use less yeast if I am planning on it. I have had times when I have been very busy and could not bake the dough for over 24 hours. The results were just as good, but perhaps a bit more yeasty in flavor.